Former hedge-fund manager David Stemerman fields a question at his first Republican gubernatorial debate Wednesday. The failed confirmation of Justice Andrew J. McDonald as chief justice of the Connecticut Supreme Court became a focal point for Republican candidates battling for governor Wednesday, as they answered whether they would uphold the longstanding custom of reappointing judges to new terms regardless of their judicial philosophy or political affiliation. The candidates generally said they would not continue that tradition and would base their decision on a review of the judge’s record. “We need to determine if they are an activist judge or not,” said Dave Walker, the former U.S. comptroller general. No nomination should be automatic, state Rep. Prasad Srinivasan said. Judges in Connecticut serve eight-year-terms, with a rebuttable presumption they will be reappointed by governors and confirmed by legislators, absent good cause, until reaching the mandatory retirement age of 70. Gov. Dannel P. Malloy’s nomination of McDonald as chief justice was defeated by the state Senate last week 19 to 16, with all 18 Republican senators voting against him. McDonald was appointed as an associate justice five years ago without experience as a lower court judge. Former Trumbull First Selectman Tim Herbst said he would not nominate anyone to the state’s highest court who lacks experience on a lower court. All the candidates decried the Democrats’ fiscal management of the state and opposed new taxes and placing tolls on state highways to finance transportation improvements. 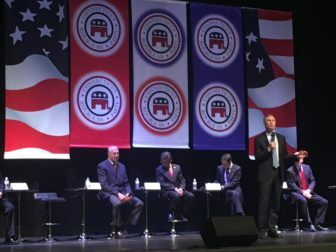 The debate at New Britain High School before an audience of about 400 people was the fourth of five gubernatorial forums sponsored by the Connecticut Republican Party. The forums held in each congressional district come before the nominating convention in May. New Britain is in the state’s 5th District and Wednesday’s forum would have been the last, but a snowstorm forced the postponement of the 4th District debate until April 18 in New Canaan. Wednesday’s forum marked the first appearance by former hedge-fund manager David Stemerman, after he was unable to attend the snowed-out debate. It was also the first of the GOP forums since Danbury Mayor Mark Boughton suffered a seizure last month in Avon. On stage with Stemerman, Boughton, Herbst, Lumaj, Srinivasan and Walker were Shelton Mayor Mark Lauretti, businessman Steve Obsitnik, and Mike Handler, the chief financial officer of Stamford. Obsitnik left the forum early because of a family emergency. The New Britain mayor said that though it was disappointing not being able to participate, it wasn’t unexpected and she knew the rules. 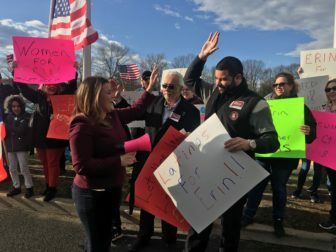 New Britain Mayor Erin Stewart high fives a supporter outside the GOP forum. “I walked across this stage to graduate high school, I raised my hand to be sworn in for my first time as mayor in this auditorium and to not be able to participate is disappointing to say the least, but we’re here to make our voices heard anyway,” Stewart said. The candidates inside also fielded questions about the state’s criminal justice system, including whether there should still be a focus on modifying sentencing policies and if they support the death penalty. Most of the candidates mentioned the need for creating rehabilitation facilities, treatment services, and job training programs for people released from prison. Lauretti, Walker, Stemerman, Herbst and Srinivasan all criticized Connecticut’s Risk Reduction Earned Credit early prison-release program and said it needs to be reformed. All of the candidates except Srinivasan and Handler agreed that the death penalty needs to be reinstated, at least under certain circumstances.